Recognizes a protein of 55 kDa, which is identified as fascin-1. HeLa, MCF-7, PC-3 or BEWO cells. Hodgkin’s lymphoma, Ovarian or Testicular Carcinoma. Recognizes a protein of 55 kDa, which is identified as fascin-1. Its actin binding ability is regulated by phosphorylation. 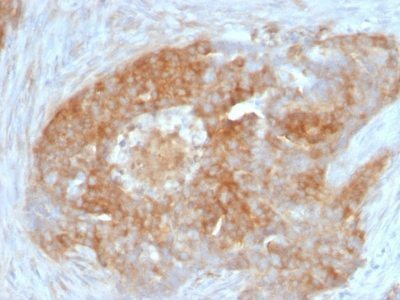 Antibody to fascin-1 is a very sensitive marker for Reed-Sternberg cells and variants in nodular sclerosis, mixed cellularity, and lymphocyte depletion Hodgkin’s disease. It is uniformly negative in lymphoid cells, plasma cells, and myeloid cells. Fascin-1 is also expressed in dendritic cells. This marker may be helpful to distinguish between Hodgkin lymphoma and non-Hodgkin lymphoma in difficult cases. Also, the lack of expression of fascin-1 in the neoplastic follicles in follicular lymphoma may be helpful in distinguishing these lymphomas from reactive follicular hyperplasia in which the number of follicular dendritic cells is normal or increased. 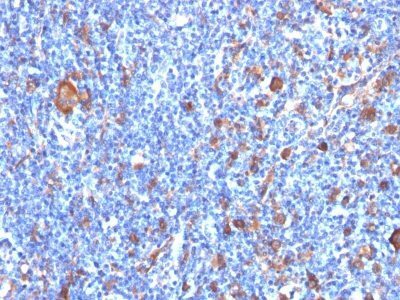 Antibody to fascin-1 has been suggested as a prognostic marker in neuroendocrine neoplasms of the lung as well as in ovarian cancer. Fascin-1 expression may be induced by Epstein-Barr virus (EBV) infection of B cells with the possibility that viral induction of fascin in lymphoid or other cell types must also be considered in EBV-positive cases. 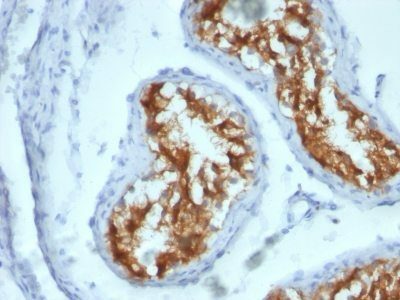 Catalog number key for antibody number 0417, Anti-Fascin-1 (FSCN1/417) The prefix indicates conjugation, followed by the antibody number and size suffix.